There are two categories of manipulations required to operate a firearm- administrative m anipulations and functional manipulations. Administrative actions include loading, unloading, or checking the status of the weapon. The functional manipulations cover the actions needed to keep the firearm operating. This category includes reloading when empty and clearing malfunctions should they occur. 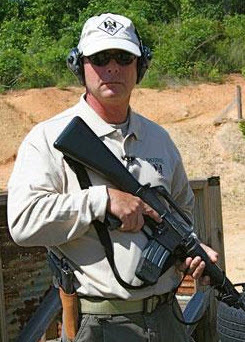 A lot of people take the administrative manipulations for granted, but they are extremely important, especially if your anticipated use of the firearm includes fighting. Loading, unloading or verifying the status of your weapon is normally done in the home, or somewhere similar, so these actions need to be performed safely. Also, and equally important, these manipulations serve as the foundation for all the functional manipulations, so it’s important to learn them well. Small details make a big difference. For example following the proper sequence is critical to performing the administrative manipulations safely and properly. The correct sequence always begins with the magazine, and ends with the chamber. The loading sequence begins by inserting and seating the magazine. Next you chamber a round, then end the process by checking the chamber, visually or physically, to verify there is a round chambered and the weapon is ready for action. The chamber or press check is cheap insurance to ensure your weapon goes bang when you press the trigger. Unloading begins again with the magazine, except now you’re removing it, taking away the source of ammunition. The weapon is cycled to empty the chamber. We teach cycling the action three times to be sure of ejection. The administrative unload ends by running a chamber check, visually confirming the chamber is clear. Again, starting with the mag and ending by checking the chamber is critical. Cycling the action, then removing the mag means you eject one round from the chamber but with the same action chambered another round. This has lead to many people having a negligent discharge with an “unloaded” weapon. To verify the status of a weapon you run the same sequence. Confirmation of an unloaded weapon starts by confirming there is no magazine in the magwell. I stick the fingers of my support hand into the magwell for a physical confirmation that it’s clear. I cycle the action three times, which is consistent with unloading, and finish by visually checking the chamber for clear. To confirm the weapon is loaded I remove the magazine, making sure it does have ammunition in it, and then insert it back into the weapon. I perform a press check to confirm the chamber is loaded. Knowing how to manipulate your weapon safely and efficiently begins by learning the proper techniques to load and unload it. The key is consistency, manipulating the weapon the same way every time regardless of the circumstances. The way I unload is the same on the range during training or practice, inside my home when I’m clearing the weapon for storage, or during a fight, using the same actions to clear a Type III malfunction.